2006 And The Death Of Tower Records Once, Tower Records was the place to go if you were searching for obscure music in any genre. The chain's exhaustive inventory and knowledgeable staff earned it adoring fans. But it wasn't the Internet that killed the retailing star. 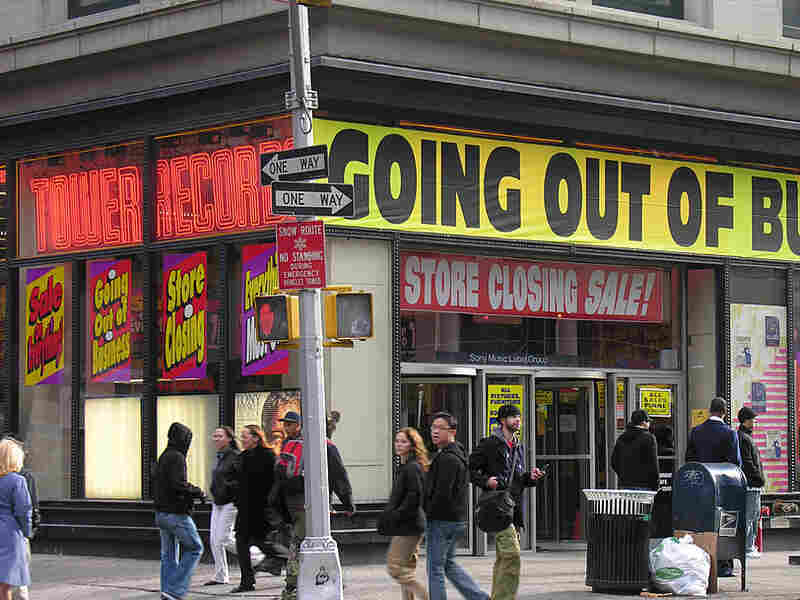 Tower Records stores across the country, including this one in New York City, had huge going-out-of-business sales in the fall of 2006. The past decade has been a period of radical change for the music industry. As we look back year by year, we turn next to 2006 — the year that Tower Records closed its doors and took down its red-and-yellow signs — at least in the U.S. Tower survives overseas and online, but its Web site has a cheap, cursory feel, nothing like the enormous music emporium that Tower's founder, Russ Solomon, remembers opening in San Francisco in 1968. "These kids that came in on a weekly basis to go to the Fillmore or Avalon [Ballrooms] or just experience the Haight scene or the whole scene," Solomon told NPR in 2006, "they wanted to know where music came from. They wanted to know the roots of all the music that was being created here by those bands." "Tower was an icon. It was a magnet. It was Disneyland the first time I went in there," says Russ Crupnick, who analyzes music retail for a firm called NPD. Back in its heyday, Tower Records was renowned for its massive inventory: rock, jazz, classical, international. If it didn't have what you wanted, it could probably order it for you. Musician Will Hoge says the Nashville Tower Records was like a cross between a music store and a public library. "That was the one place you could also buy rock magazines — the magazines you didn't see anywhere else. You know, English rock magazines," Hoge says. "It was a great way to discover new music." "You could go in and not be lambasted by the staff for wanting to buy a Christina Aguilera record or whatever it was that you needed," Hoge says. "But then, you could also go and have these people really hip you to something that you'd never heard of." Hoge says the Nashville Tower staff pointed him to some of the classic country that shaped his own sound. In fact, he says two of his personal milestones were seeing his poster up at Tower and playing his first in-store show. Those in-store performances were another thing that set Tower apart — and had mostly disappeared by the time the U.S. stores closed in 2006. By then, people were getting their music in very different ways. But you can't necessarily attribute Tower's decline to the rise of digital music. "Folks would say, 'Well, wasn't this all about Napster?' And I'm like, 'Not so much as the fact that I think Tower just sort of lost relevancy,' " Crupnick says. Big-box stores undercut Tower in pricing CDs. Baby Boomers stopped buying new music. Young people stopped caring about liner notes and owning a physical product. And Crupnick says that, by the late 1990s, Tower Records was no longer a music lover's mecca. It was just a higher-end Sam Goody. "They became very ordinary, in terms of their expansion plans," Crupnick says. "And arguably, as they went to about 90 stores, they lost that whole idea of being special." You could almost say the same about the value of listening to music, Crupnick says: Often, it just plays like a soundtrack for lives lived before screens. Crupnick points out that two-thirds of the music sold in this country is still on CD. And the music stores still succeeding seem to have remembered a few things that Tower may have forgotten: a sense of discovery, a passionate staff — reasons to not go online.